This post is about dolichocephaly, a form of positional molding which affects some breech babies – how it happens, why it may be important, and how to recognise it. Can we predict which babies’ heads are more likely to have difficulty passing through the pelvis? 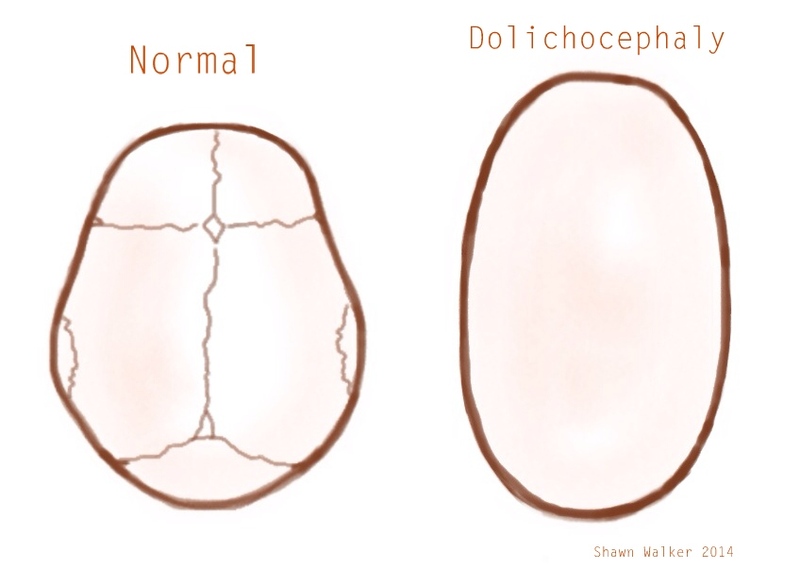 I don’t know, but I feel one phenomenon in particular deserves more attention – dolichocephaly. Technically, dolichocephaly is a mild cranial deformity in which the head has become disproportionately long and narrow, due to mechanical forces associated with breech positioning in utero (Kasby & Poll 1982, Bronfin 2001, Lubusky et al 2007). This change in shape is more commonly associated with primiparity (first babies), larger babies, oligohydramnios, and posterior placentas, all of which result in greater forces applied to the fetal head. 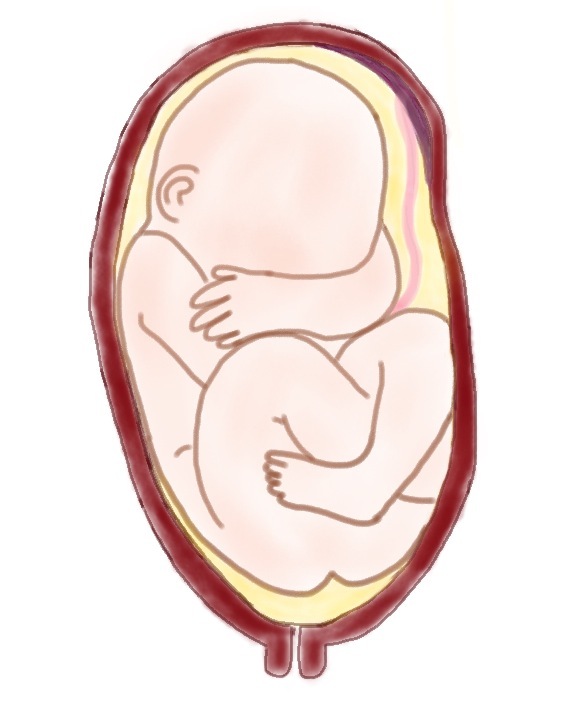 Following the birth of the arms in a breech birth, the head will be in the anterior-posterior diameter of the pelvis. 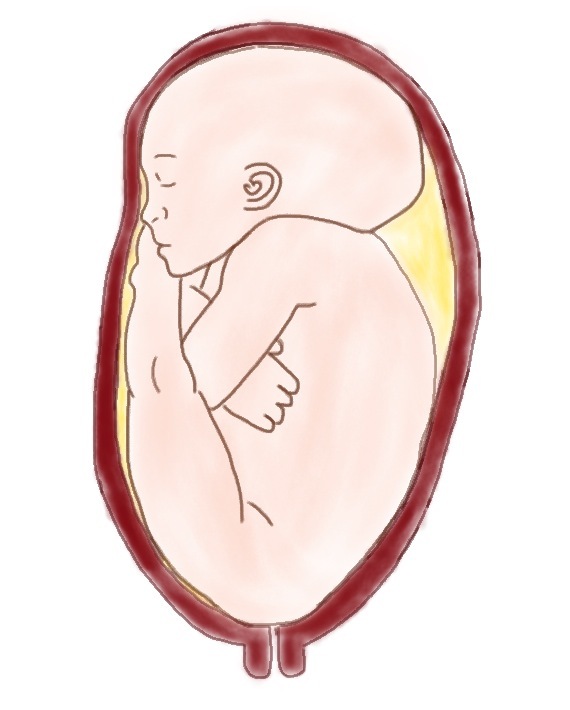 When the head shape has become abnormally elongated, the longest diameter of the fetal head will meet the shortest diameter of the maternal pelvis at the inlet. Unless the baby is still on the small side and the pelvic inlet very round, the chin may get stuck on the sacral promontory, preventing head flexion. A very experienced breech provider will have encountered this situation before, and should be able to assist, but it is quite a tricky place to be. The head may need to be rotated into the transverse diameter to safely enter the pelvis. A very elongated head can have difficulty passing through the lower pelvis as well, and can cause damage to the maternal pelvic floor, unless appropriate techniques are used to assist the head to flex. Estimation of fetal weight by ultrasound is notoriously inaccurate. However, a lack of proportionality between the head circumference and the biparietal diameter is more obvious to spot (e.g. HC=90th percentile, BPD=60th percentile; or a difference in correlating dates of two weeks or more), and may be a more relevant indication that this baby is too big for this particular woman. Dolichocephaly can be discerned on palpation as well, as the occiput is prominently felt above the fetal back, the head is not ballotable, and may feel unusually wide. I would suggest caution where estimated fetal weight is above 3500 g and a difference in HC and BPD, or careful palpation, indicates abnormal cranial molding has occurred, especially for women who are having their first baby, have a low amniotic fluid index, and/or a high posterior placenta; and in situations where imaging pelvimetry is not used to confirm an ample pelvic inlet. Women instinctively do not like weight limits used as ‘selection criteria.’ One woman (Ann, multip, 6’1”) looks at another (Carol, primip, 5’0”) and they both think – We can’t possibly be expected to have similar-sized babies. While Ann may carry a 4000 g baby with no abnormal head molding, and expect a straightforward birth, Carol’s baby may begin to show signs of dolichocephaly at 3300 g, especially if she has low levels of amniotic fluid and a posterior placenta. Carol may still have a successful birth, but it will more likely depend on the skill and experience of her attendant in assisting the aftercoming head to flex, rotate and negotiate the pelvic diameters, and the pelvic diameters themselves. We need to move away from the concept of ‘selection criteria,’ which are used by professionals to make decisions for women, and towards an understanding of what is ‘normal for breech.’ We need to understand more about which babies are more likely to experience those beautiful, often-easier-than-cephalic, dancing-into-the-world births, and which babies are truly being put at additional risk by their in utero conditions. Then we will be able to explain to women the benefits of a caesarean section for pregnancies which have become ‘abnormal.’ Women will be able to approach this intervention with an open heart when they observe professionals are truly supporting ‘normal’ breech births and providing individualised care and screening to those which are not. I would love to know what others think about this. This entry was posted in Breech Skills, Informed Care, Risk Management and tagged breech head, clinical skills, dolichocephaly, for L, informed choice on April 1, 2014 by midwifeshawn. Midwife with a special interest in complex normality, especially breech. Enjoyed reading . Makes sense . Am now thinking what are the skills I need as an attendant and how to know which way to turn baby if chin is wedged on coccyx .also palpations I find hard sometimes . Indeed! I am still working on that one myself. Palpation will come with practice. Keep a self-audit of weights and positions. Give yourself permission to not be right all of the time. 75% of babies referred to my clinic for ?breech were cephalic on USS, and 30% of all breeches are missed. Clinical skills and technology should back each other up. Good to know .. I would be keen to hear of your experiences using this information in practice. Great, Clare. Please do share any experiences you feel have helped you, and will help others, as appropriate. We’re all learning from each other. I can see how this situation can cause one to miss a breech presentation as the head would feel more like a bum. Yes, great point Carly. Another midwife said this to me recently .. if it had not been for the scan, she would have thought it was a bum. To me, already knowing it was breech, it felt like an abnormally elongated head, sitting in transverse (and was). Thanks, Jacque. We do indeed need to share and continue to learn as much as possible. Thank you .. I will be interested to hear if you find it useful in practice. I always say: the fat is on the bottom, not on the head. So a small baby has more risk to get stuck with the head than a bigger baby in breech position. If the baby is bigger, the head is not the bigger part, but the bottom is. Thank you for this, Janke. I agree that when bigger babies fit through a pelvis, it stands to reason their heads will, and of course a bigger baby will be more resilient in the case of a delay. However, as with a cephalic baby, fitting through the pelvis easily requires the head to be in an ideal position. I feel a misshapen head which becomes deflexed in cases of fetal compromise may have more potential to become caught at some stage in the birth process, and therefore become dependent on the birth attendant to help the head into a more ideal, flexed position to navigate the pelvis. But it’s just a theory! If you have experience attending breech births, I would love for you to consider participating in my research! I have a student who was described as having this condition. Does it have any negative effects on academic performance? My head is long I’m african too but I wanted to know how I can get it smaller if it’s possible. Does anyone have answers please ?? Thanks for this post, it is really reassuring. I am currently pregnant 36w4d and baby is in breech position whole the time. And unfortunately baby head is abnormal like you described. I understand reasons why head shape is like it is but what constantly worrying me is will this shape of head will be changed after labor? It is scary for me to accept that this shape is permanent. I read a lot about operation to change head shape and I am hoping that won’t be neccesary for my little girl. Thank you so much for this article. My baby (first) was breech but we didn’t know until 36 weeks. Three different midwives had assured me that she wasn’t breech but the fourth caught it and we believe she had been for quite a while. No one ever mentioned the term Dolichocephaly, but I’m almost certain that’s what she had as her head was so elongated. It has since rounded out just fine. I had no option of a vaginal birth once we found out Baby was breech but I’d love the medical community to open its perspective to look into vaginal breech births as more of a possibility, keeping head shape and size in mind, rather than simply closing that door altogether, often unnecessarily, for lack of knowledge/research. Dear Shawn, thank You for this article. My baby boy is now 36 weeks and in frank breech position. Today we had an ultrasound: His belly circumference is now about 20 percentile and his head on 95 pc. All of the ultrasounds before were fine, and head and belly were at the same percentile. Now there is a big discrepancy. Is that normal that now the head is “flattened” due to his frank breech position? Usually, even with breech babies, the head and body are on a similar percentile. We call this ‘symmetrical growth.’ A big discrepancy is called ‘asymmetrical growth.’ I can’t really comment on what this means for you and your baby because I am not providing clinical care. You should discuss these findings with your obstetrician and get her/his opinion. Visit our on-line shop. Image by Merlin Strangeway for Breech Birth Network, CIC.